Hidden in Montegiovi just outside Castel del Piano, this gorgeous garden belongs to lifetime sculpture and devout Buddhist Piero Bonacina. A visit here is like visiting the world in an afternoon, from India to the Orient, America and back to Europe. 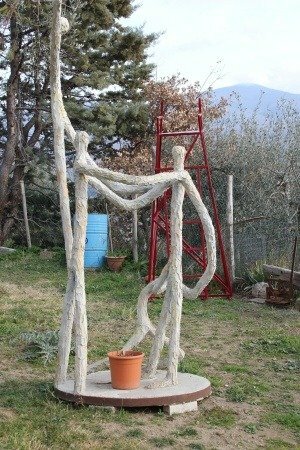 If the weather’s nice, Bonacina will sit under the shade of an olive tree, look out on to the valley below and carve beautiful wood sculptures that capture these far away places. Often he decorates these sculptures with metal, concrete and stone, and paints them bright colours that seamlessly match the oasis he has created. He then strategically places them in his garden among the flowers and trees. Bonacina is a true artist and is inspired by the world around him, for example the Twin Tower bombings or the chaos of the modern world, but his favourite subject is man, who he represents with beautifully twisted steel and usually places on top of the world or in the arms of woman. This garden is definitely a must see, especially for those who love sculpture art and enjoying seeing it in a extremely free and organic setting. Bonacina has spent 15 years creating these pieces and opened this garden amid public demand. His sculptures are just that spectacular. Upon request, which means stopping by and asking Bonacina if you can visit or by calling the tourist information centre in Castel del Piano on +39 0564 969602.